Gregory Chrispin is Senior Vice President, Wealth Management and Life and Health Insurance. In this capacity, he is responsible for the activities of Desjardins Securities, Desjardins Investments, Desjardins Global Asset Management and Desjardins Financial Security. 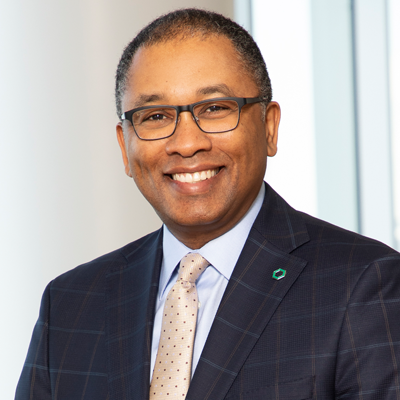 He is also President and Chief Executive Officer of Desjardins Financial Security and Director of Northwest & Ethical Investments L.P.
Gregory oversees the development of products and services geared to the specialized savings and life and health insurance needs of our members and clients. He also supports the integrated distribution of these products in the caisse network and the complementary networks. He also chairs the Quebec committee for the Canadian Life and Health Insurance Association (CLHIA-Quebec) and is vice-chair of the board of Aviso Wealth, a leading investment management service provider. Gregory has worked in the financial sector for more than 30 years. He joined Desjardins Group in 2010 as President and Chief Operating Officer of Desjardins Global Asset. Prior to this, he was President and Managing Director of State Street Global Advisors Canada (SSgA). He holds a bachelor’s degree in actuarial mathematics from Université de Montréal, is also an Associate of the Society of Actuaries and member of both the Canadian Institute of Actuaries and the CFA Institute.